Mrs. Carolyn Jennings, widow of Deacon Ernest Jennings, stands with Pastor Howard Jones to unveil the apartment sign. 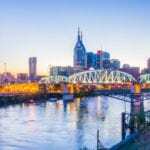 NASHVILLE, TN —Fairfield M. B. Church, located on Dickerson Road in Goodlettsville, unveiled a significant sign to its apartment complex the church has owned for approximately 20 years. 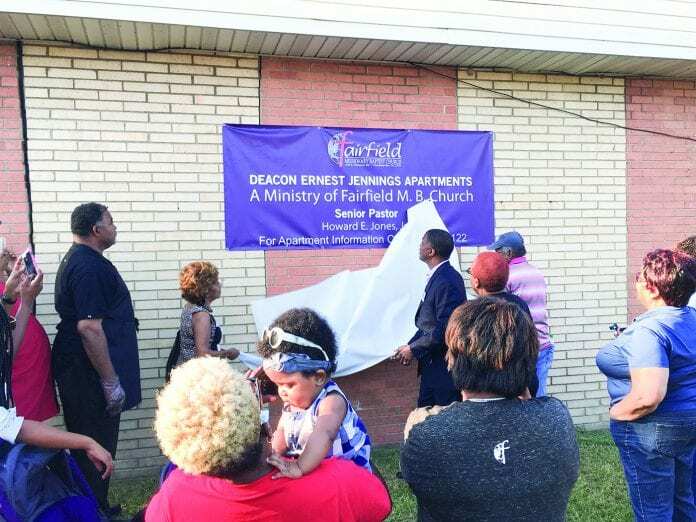 The 2-building, 8 unit apartments were named in honor of Deacon Ernest Jennings, who was a stalwart in the church and led the charge for the church to own these units. Before the move to Goodlettsville, the religious edifice of Fairfield was located at the corner of Fairfield and Fain streets in south Nashville, next door to the apartments. More than 20 members of the Jennings family were present for the special event, including his widow, Carolyn Jennings. Pastor Howard Jones, Jr., senior pastor of Fairfield for nearly 30 years established the Vision 2000 Committee to seek ways to be more involved in the community and serve the people. “These apartments are a meaningful and significant ministry of our church,” said Pastor Jones. There is much concern about affordable housing in Nashville as it continues to grow and develop, with an average of 74 people moving to the city a day. Moderate and low income residents are struggling to find affordable housing with reliable transportation services. The Jennings Apartments, have been that for residents for nearly two decades. With a modest increase in 2017, rent for the two-bedroom apartments is below $600.00 plus utilities, located approximately two miles south of Music City Center off Lafayette.